An essential document to log all your fire safety equipment and routine maintenance checks. Most businesses are aware of the legal obligation to undertake a Fire Risk Assessment of their premises. It is also a legal requirement to provide and maintain accurate records relating to fire precautions. 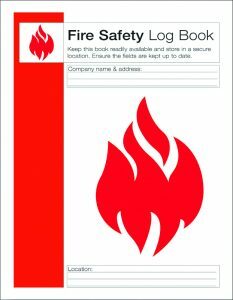 If the Fire Safety Log Book is utilised it shows to anyone inspecting the building that you have good working practices and checks in place relating to fire safety. It will also assist anyone who is completing a fire risk assessment as this book can used as a reference point.